« Facebook Pages: One Church Page or Many Ministry Pages? This weekend Daylight Savings Time begins in the U.S., which means setting our clocks forward and seeing who shows up an hour late to church on Sunday morning. Help your congregation with a simple reminder on social media. A free Daylight Savings graphic to share is below. A simple reminder can be huge. It’s a little late to put something in the bulletin, so use your more immediate communication channels, whether that’s email, social media, text or more. You can use our image below to post to Facebook or other social networks. 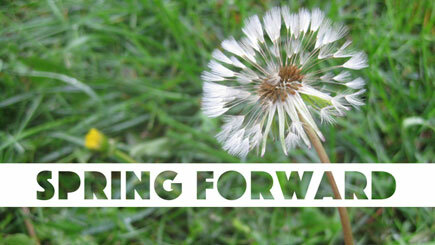 Add some text to remind people to set their clocks ahead and add your worship times. Whatever works for you. Incentives are fun: Offer donuts or other goodies for those who remember and show up on time. Have more fun with the late arrivals: Come up with a gracious plan to welcome those who forget and show up late. Maybe save ’em a donut. We encourage you to get creative and make your own graphics. The Church Graphics Handbook by Brady Shearer can be a big help if you’re not sure where to start. It comes with templates and graphics you can edit and tweak. Join Courageous Storytellers for an archive of all kinds of social media graphics and stock photos, among other practical resources for church communicators. Ouch! Thanks Matt. I put the graphic together and I’m clearly a writer and not a designer. While it might not be top-notch design, it is a resource churches can use for free. And a lot of churches took advantage of that. Many don’t have access to even a non-designer like myself, so something is better than nothing. And if you don’t like the design, you’ve got the PSD files and can drop the design and use the image. And we never asked for a donation. We made that an option for anyone who wanted to give something back–and believe it or not, some people did (we are a nonprofit, so every bit helps). But we never said “please donate.” In fact, we spent more time talking about how not to donate.